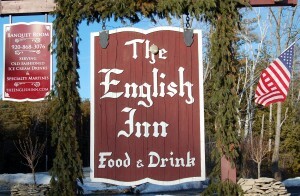 The first and biggest thing Randy Daubner wants you to know about the two English Inns is that the menus are the same. 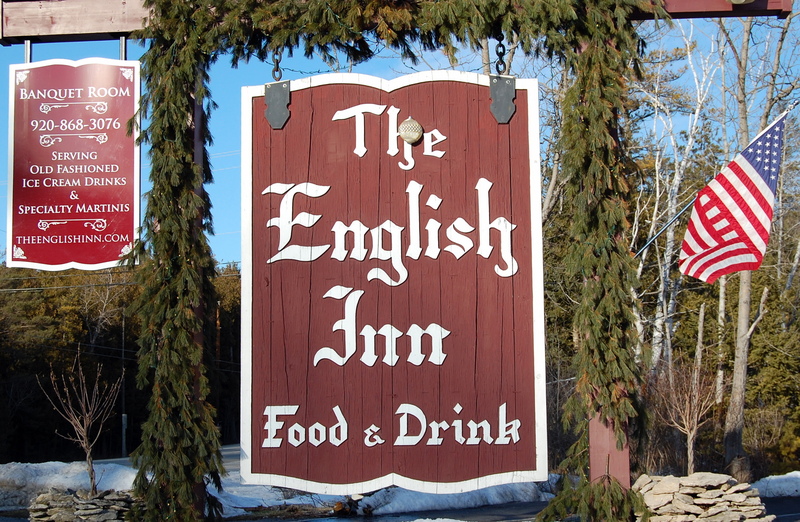 Two English Inns? Yes! Last year their Green Bay location opened to rave reviews and relieved customers who may not always have the option of taking a day trip to Door County to enjoy the Inn’s fine dining in Fish Creek! 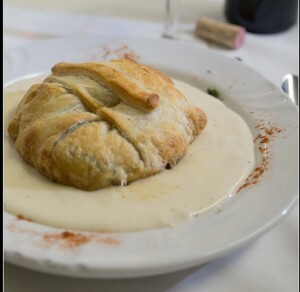 Their customers’ favorite menu items include their signature dish: Beef Wellington (always available whether on the menu or not); their Hot Spinach Salad (their famous Hot Bacon Dressing is also for sale and very, very popular); and the seven different ways they prepare whitefish including French Broiled, BBQ-Bacon-Onion, and Pistachio Encrusted Whitefish. They also serve their popular ‘All You Can Eat Friday Night Fish Fry’ to which they have added tasty Blue Gill! “We’re successful at creating a quite delicious menu, so why change anything?” says Daubner. The decor and theme of the restaurant is similar in both locations but the new Green Bay restaurant has a bit of a richer, darker feel. The custom-made bar fills the room, a crystal chandelier adds a certain sparkle, and a wall of windows overlooks the bay. Outside, there is a patio with a fire pit, a fountain, a pond and an even better opportunity to see the view of Green Bay. As the restaurant is right on a bluff overlooking the bay, people this spring have already insisted on eating outside just for the view. 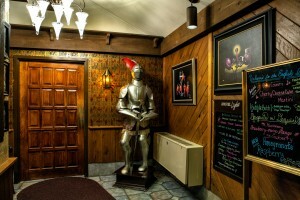 If you’ve enjoyed a meal at the Fish Creek location, you’ll know that regular customers there are welcomed each visit by two armored knights on valiant steeds facing each other as patrons walk the path to the door. These were made by local Fish Creek artist Cy Turnbladh at Hands On Art Studio many years ago. 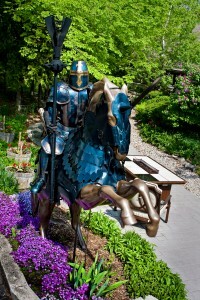 Not to be left out, the Green Bay English Inn will soon have an even larger knight on an even more imposing horse, this time made by Sturgeon Bay recycled metal artist Miles Amorelli. The new horse will be made from stainless steel, each component fabricated by hand. It will certainly be visible with the horse’s glowing eyes flashing on every fifteen minutes as steam is exhaled as well! Whether you frequent the Fish Creek or the Green Bay location, you will be greeted by outstanding art, delicious food and great service, for a complete dining experience. 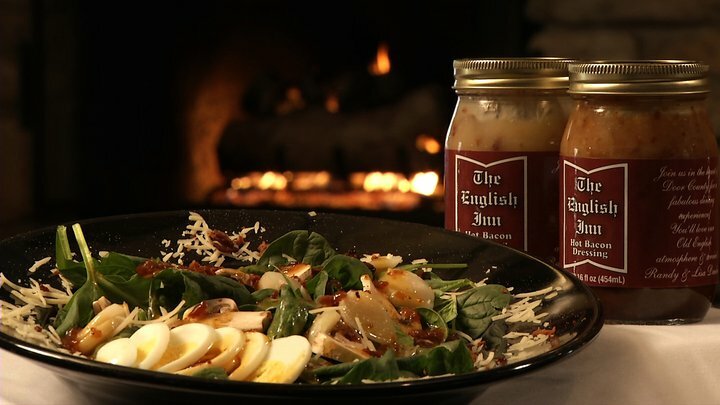 Casual and classy, chivalry lives on at The English Inn, so open those doors and pull out those chairs, and enjoy the ambiance while you dine. 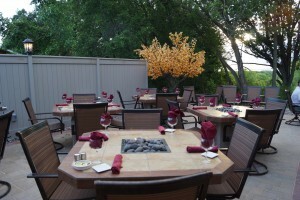 A one of a kind restaurant with two locations, right here in northeast Wisconsin! Open Knightly at 4pm year-round.